The House of Representatives will vote today on a Constitutional amendment today making it illegal to desecrate the American flag. As Paul Gessing points out, the amendment has a better chance of passing the Senate than it has in the past. This is a silly feel-good amendment. This is not a pressing national issue, and does not merit a Constitutional Amendment. Not only that, but Congress is considering banning something that does not happen very often. As Eric Heyl points out, there are very few cases of flag desecration each year. The fact that Congress is wasting taxpayer dollars to even consider this amendment is offensive in and of itself. What compelling state interest is there in banning desecration of the American flag? No one's rights are violated when someone desecrates an American flag, provided that flag is owned by the person desecrating it or the flag's owner consents to it being desecrated. Desecration of the flag may cause many people to be upset, but there is no right to not be offended. On the AM 1370 Afternoon Edition, Don Moore suggested that the amendment was not all that important because it happens infrequently. While Moore is correct that few people will have their rights restricted by this amendment, the principle behind banning desecration of the American flag is far more important than how many people such a ban would affect. 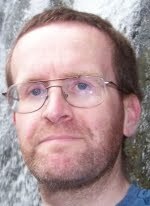 The federal constitution should not be placing limits on political speech. As I pointed out in my opinion column on this issue in January of 2004, a flag desecration amendment would not ban burning the American flag. In fact, the U.S. Flag Code (see here, here and here.) 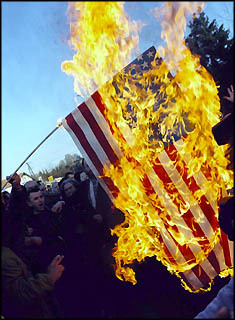 says that when the flag becomes unfit for display, it "should be destroyed in a dignified way, preferably by burning." (Emphasis is mine.) A flag desecration amendment would instead ban the thought behind the action. If those who support this amendment are serious about making sure the flag is treated with the proper respect, let them lead by example. Every single member of the House and the Senate who votes for this amendment should immediately stop using the American flag in advertisements for their re-election campaigns. Congress should also move to prevent the U.S. Post Office from issuing flag stamps. Somehow, I doubt they will take these steps. In passing this amendment, Congress desecrates the flag more than anyone who sets a piece of cloth on fire. The flag stands for the values that America holds dear, limits on government power and respect for individual liberty. Those values are far more important than any flag could ever be.